Michigan State University Press, 2018. Girard claimed that mimetic desire is not only the way we love, it’s the reason we fight. Two hands that reach toward the same object will ultimately clench into fists. Think of A Midsummer Night’s Dream, where couples dissolve and reassemble, tearing friendships asunder as the two men suddenly want the same woman. Whatever two or three people want, soon everyone will want. Mimetic desire spreads contagiously, as people converge on the same person, position, or possession as the answer to a prayer or the solution to a problem. Even conflict is imitated and reciprocated. Haven is a seasoned literary journalist who has devoted books to Czesław Miłosz and Joseph Brodsky. She is attracted to the theme of civilization embattled, the persistence of culture, and its defenders in the face of barbarism and indifference. Her study of Girard is neither clinical nor drily academic. It welcomes readers previously unfamiliar with Girard and his work, as well as specialists. It also serves as an hommage. Haven befriended Girard and his family in his later years at Stanford University, an intimacy that provides glimpses of the husband, father, colleague, and friend not immediately available to readers familiar with his thought strictly through his books. Haven draws an attractive portrait of a thoughtful man who, until his death in 2015, was never too self-important to treat others with dignity and respect. Girard resists simple disciplinary pigeonholing. He made contributions to literary criticism, philosophy, psychology, anthropology, history, sociology, biblical interpretation, and theology. He began his writing life as a literary critic. In his first book, the influential Deceit, Desire, and the Novel (1961), are detectable the earliest stirrings of mimetic theory. Girard looks at the novels of Stendhal, Flaubert, Dostoevsky, and Proust, and concludes that the “great novelists reveal the imitative nature of desire.” We live with the myth of the sovereign self, dismissed by Girard as a “romantic lie.” The novelists systematically dismantle this cherished fiction, not in philosophical tracts but through storytelling. The protagonists, by pursuing their desires—wealth, love, social status—inevitably come into conflict with others having the same goals. The grimly comic high point of Haven’s book comes in the chapter (“The French Invasion”) recounting a conference organized by Girard at Johns Hopkins University in 1966, “The Languages of Criticism and the Sciences of Man.” Theory had arrived in the new world. Haven says Girard “champion[ed] a system of thought that was both a child of this new era and an orphan within it.” Present at the conference were the future superstars of intellectual fashion: Lacan, Derrida, Barthes, and the rest. “Lacan,” she assures us, “was high-maintenance.” Girard later came to refer to the importation of structuralism and its academic successors as la peste. 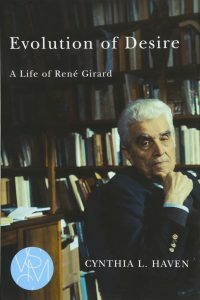 Central to Haven’s understanding of Girard is his conversion from atheism to Christianity in 1958–59: “It was something no one could have anticipated, least of all himself. ‘Conversion is a form of intelligence, of understanding,’ he said; it’s also a process … and as such would absorb him for the rest of his days.” The experience occurred while he was working on his study of “triangular desire,” Deceit, Desire, and the Novel, and he rewrote portions of the book to reflect his new state of being. Haven traces all of Girard’s subsequent thinking, all of his many books, to this conversion experience on the Pennsylvania Railroad while commuting between Baltimore and Bryn Mawr College. Rivalry and violence, in Girard’s view, result inevitably from the clash of mimetic desires. What then follows is often scapegoating. The rivalrous discord is refocused onto a third individual or group from the outside. The former rivals form a unified front and redirect their efforts toward a handy scapegoat, whose elimination, they convince themselves, will resolve the original conflict of competing desires. A peculiar thing occurs: the scapegoat, once safely out of the way, is sanctified, even deified. The story of the scapegoat comes to serve as a founding myth for cultures and religions. Girard detected in scripture the sacrificial, scapegoating nature of all religions and cultures, but with a difference: Jesus, the ultimate scapegoat. Bleak resignation to a relentless cycle of conflict and blame turns into hope. In Haven’s words, “The way to break the cycle of violent imitation is a process of imitatio Christi, imitating Christ’s renunciation of violence. Turn the other cheek, love one’s enemies and pray for those who persecute you, even unto death.” Girard’s spiritual revelation, Haven writes, “became his work.” He returned to the Roman Catholic Church he had been born into, renewed his marriage vows and had his children baptized. The murder of Jesus exposes the truth of all sacrifice: victims of a frenzied mob are always innocent. Group violence is always unjust. Summarizing Girard’s insights, Haven writes: “We live derivative lives. We envy and imitate others obsessively, unendingly, often ridiculously.… We find it easy to critique the mimetic desires of others, but our own snobbishness and sensitivity to public opinion usually escape our notice. We wish to conceal our metaphysical emptiness from others, in any case, and from ourselves most of all.” As the pies are flying in the Sweet Pie and Pie, Moe pauses and sententiously declaims, “Stop, stop. This has gone far enough. Love thy neighbor.” On cue, five guests, including a pompous U.S. Senator, push cream pies into his face. Patrick Kurp is a writer living in Houston, and author of the literary blog Anecdotal Evidence.